I’m on a race with Cameron Lackpour on this and I believe that he is going to beat me. You might be thinking what Focused Aggregation is (I really like that term), I stole it from Cameron’s blog :). Even the idea shared here is not mine. You might have used this technique, however might not have heard the term and vice versa, if so have a look at these wonderful blog posts from Cameron. On a side note, I think that was the first and second time my name was referred by him (someone like him) on his “Love-Hate” series on Calc Manager rules. After reading his posts you might be thinking “Isn’t that same to <Calculate Form> business rule on WebForm?”. There was a not so old thread on Network54 and Christian M updated the post Network54 with his question. What he updated (I’m happy that he came across an issue and thought of updating the post), just blew our minds. It is awesome, super cool hack. 1. Create a User variable in Planning and use that in Rows. I found an issue with spaces and variables, Planning adds the variable within quotes and this will cause an error when you open the form. Assign the Default Value as &My_Entity. Script View of Calc Manager shows that it is picking up the default value. I wrote about this earlier in a post, however just thought of repeating it. When you use hide prompts on WebForm Planning is hiding all the prompts coming from Page/POV (because it knows which one to pick from). What happens when the prompt member (dimension) is from Column/Row, yes it’ll show the prompt window and then will ask you to select a member. However you can hide it by supplying a default value and make it hidden in Calc Manager rule. Enter Values in WebForm, run the rule and there you go focused aggregation on row/column members. 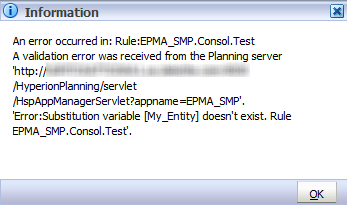 I looked at the logs and yes it is passing the User Variable value to Essbase. This is great Celvin. This is more than moving toy car and guy from the corner. This is awesome Celvin! Thanks a lot for sharing this.